A Follow Spot: ISU Brings in Playwright, Stages Clothing Drive for "The Women of Lockerbie." ISU Brings in Playwright, Stages Clothing Drive for "The Women of Lockerbie." "The Women of Lockerbie," by Deborah Breevort, is the kind of play that really suits the college theater experience. The play acts like a Greek tragedy in performance, as its characters deal with the horror and sorrow that came after Pan Am flight 103, en route to New York from London, exploded over Lockerbie, Scotland, the target of a terrorist's bomb. There is a mother, despairing and lost, searching for any hint of her son who died on board the plane, and a Greek chorus of women in Scotland, hoping to recover the clothing that was scattered on the ground when the plane blew up, so that they can wash these personal items and return them to the grieving relatives left behind. "The Women of Lockerbie" opens on September 30th at ISU's Center for the Performing Arts, directed by Emily Gill, with a cast that includes Eliza Morris and Tori Allen. As a special addition to the production, playwright Deborah Brevoort will visit Illinois State University on October 4th and 5th. Breevort is scheduled to present a lecture on October 4, to attend that night's performance of the play, and she will stay after the show to discuss the play and respond to questions from the audience. In keeping with the play's examination of what articles of clothing can mean on a human level, some of the people connected with the play have launched what they are calling "11,000 Pieces of Clothing," a drive to collect clothing for local charities. Their Facebook page notes, "From warm coats for school children to interview-wear for job hopefuls, we want to help everyone in the community feel the comfort that clothing brings." They've chosen the number 11,000 in honor of the women of Lockerbie, who cleaned and sorted that many garments. You are encouraged to bring your clothing donations to performances of the play, and then tweet or post on the Facebook page linked above any personal message to explain why you chose that particular piece or what it meant to you. It's a lovely idea, and a great way to bring the experience of "The Women of Lockerbie" even more alive. 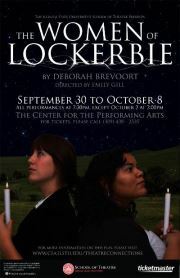 "The Women of Lockerbie" plays from September 30 to October 8 at the Center for the Performing Arts on the ISU campus. Click here for ticket information. What a great idea, the clothing drive. So beautifully fits the spirit of this play. Gosh, I wonder if I could go Oct. 4 after the cemetery walk? That would fit in, too.